While Amazon has yet to comment on reports it is reconsidering Long Island City for its HQ2, politicians and industry groups have thrown their support behind the project. The Washington Post last week reported that Amazon is reconsidering building an eight million square feet complex in Queens in the face of loud opposition to the project. But shortly after, the New York Times debunked that story saying Amazon had no plans to back out. Amazon has not responded to requests for comment from Real Estate Weekly and has yet to comment publicly on the reports. TF Cornerstone, who along with Plaxall would be building the new headquarters, also declined to comment. But the whisper campaign has brought out supporters who say the Amazon deal and its 25,000 jobs is too big to fail. On Tuesday, a coalition of Amazon supporters from the local community spoke out and called on legislators to back the HQ2 project. 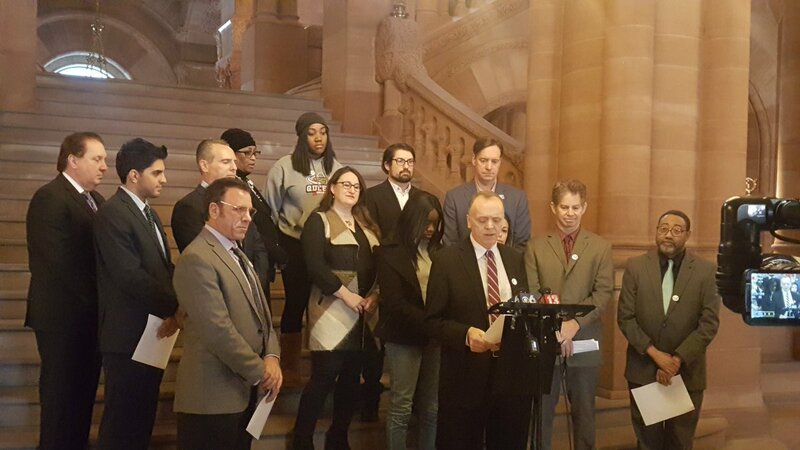 And the nonprofit, Association for a Better New York, pointed to one of their recent studies that shows incomes related to the city’s tech ecosystem are 49 percent higher than other sectors and 45 percent higher for New Yorkers without bachelor’s degrees. Elizabeth Lusskin, the president of the Long Island City Partnership, said the HQ2 proposal was the result of more than 40 years of work from the community to ensure diverse and well-paying jobs to the area and borough. The New York Building Congress threw their support into the debate as well, urging opposing officials and residents to support the project. For Governor Andrew Cuomo, one of the main orchestrators for the Amazon deal, one of the major roadblocks right now is the political opposition. Cuomo added that the State Senate opposing Amazon was “governmental malpractice,” calling them irresponsible to allow political opposition to overcome sound government policy. Pictured top: Brendan Leavy from Queens Chamber of Commerce during a demonstration in support on HQ2 in Albany this morning.